A local Worcester Parker has decided to ride a bike over 300 miles in 4 days to raise money for charity. Hamptons resident Sarah Draper has taken on the gruelling task of cycling from London to Paris to raise money for Myeloma UK. In order to help the cause, she is putting the fun into fundraising by holding an event at Maple Lodge this afternoon involving champagne, cake and live music. "To help me raise money for this amazing charity I’ve managed to squeeze an afternoon of cake eating and champagne swigging into my intense training schedule. So all you lovely and of course generous people are invited to join me for a fun filled afternoon with tunes, tipples and tea! I’ll be performing a range of live music from classical to jazz to pop and back again with my good friend James Taylor. Plus lots of goodies up for grabs in our raffle and auction." You can find out more about Myeloma UK by having a butchers at http://www.myeloma.org.uk/. 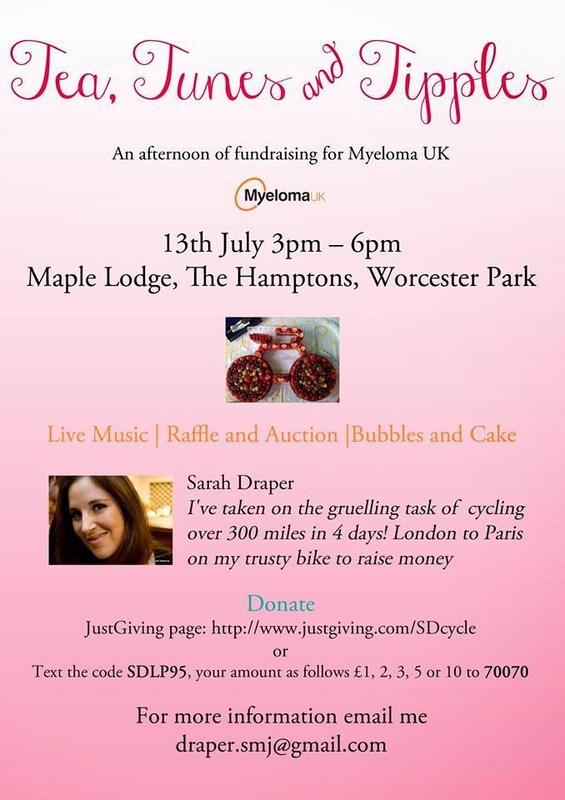 Sarah has set up a Just Giving Page which can be found at: http://www.justgiving.com/SDcycle. You can even text the code SDLP95, and your donation amount as follows £1, 2, 3 , 5 or £10 to 70070. You can also find out more from Sarah's facebook page here. Either way the big event begins this afternoon at 3pm at Maple Lodge (The big white building with the clock on top in the Hamptons.) What better way to whittle away an afternoon than with bubbles and cake - and all for a good cause!